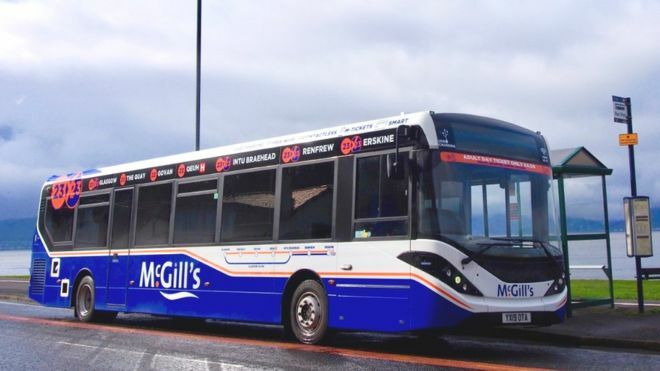 The buses were supplied by Falkirk-based Alexander Dennis and designed to meet European ultra low emission vehicle (ULEV) standards.Greenock-based McGill's said they also exceeded the Glasgow Low Emission Zone standard.The vehicles will be used on two routes - Erskine to Glasgow and Glenburn/Nethercraigs to Paisley.McGill's said the latest purchases brought its investment in new fleet over the past five years to nearly £24m.Chief executive Ralph Roberts said: "This is a milestone investment for McGill's which benefits the environment, our passengers and in turn, serves the wider economy. "Some campaigners claim that bus operators are not doing enough to tackle air pollution but this investment in 26 new vehicles brings our average bus age down to under seven years old - the youngest large private fleet in Scotland. "It demonstrates that we're going the extra mile and taking a long-term approach to our operations."